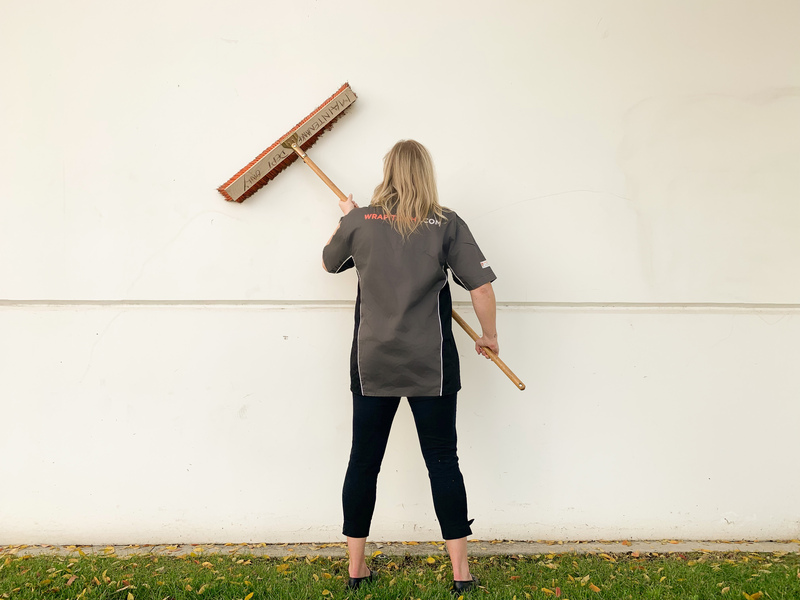 Before using a vinyl to wall compatibility test it’s important to guarantee that the surface is free of loose dirt and particles; brush off all spider webs, remove aggregate or dirt from the grout lines and wall with a broom. For interior walls, clean off all the loose dirt with a wet low-lint towel and use Isopropyl alcohol to wipe the wall down. Taking this step will make for a clean slate to conduct a compatibility test. There isn’t a one size fits all for wall vinyl. With hundreds of different surfaces, it’s important to conduct a site survey before deciding if the wall can be wrapped and what vinyl you need to use. After determining that the integrity of the wall is solid, the next step is to identify the type of paint on the wall. Details to consider for this step are: Is the paint on the wall compatible with the vinyl that will be applied? How long has the paint been on the wall? How many layers of paint are there? During the application, will the vinyl peel off any paint if repositioning is needed? These are all important points to consider since most of the low or zero VOC paints or all-in-one paint and are no longer compatible with most PSA films due to the additives that are added in the paint formulation. If the film is printed with solvent or eco-solvent based inks, allow the film to outgas for 24 hours prior to lamination and installation. Trapped solvent in the film will make the vinyl film soft making it more difficult to install. Trapped solvent will also impact the adhesive bond strength to the wall. 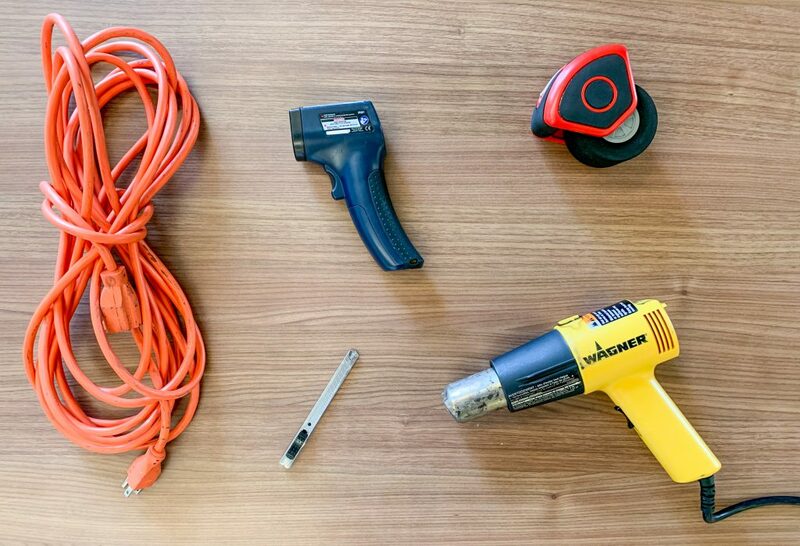 For installing wall wraps we recommended using a heat gun, extension cords, cutting blades, RollePros, and an IR thermometer. 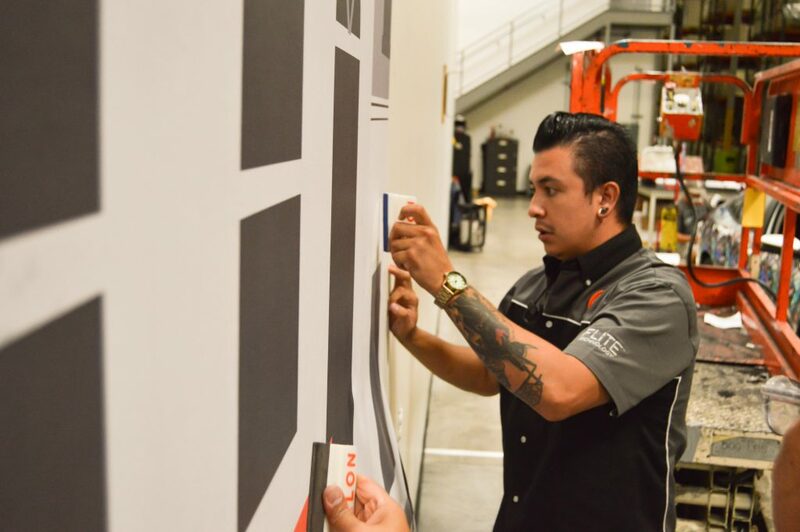 No matter what the deadline is for a project, don’t rush; take all the pre-installation steps to ensure your next wall installation will be a success. 1. Why is an ICC profile important for printing? ICC profiles provide accurate color, optimized ink linearization, and printer heat settings. Without the correct media profile, the media may get overloaded with ink, head strikes may occur during printing from temperature being too high or large of a gradient between the heat zones, or an unnatural color may arise. 2. Why is ink configuration important? Printer manufacturers design their printers to be able to run 4 colors (CMYK), 6 colors (CMYKLcLm), 7 colors (CMYKLcLmLk) or more and because of this, each ink configuration requires its own unique profile on the printer. 3. What is the difference between 6, 8, and 12 pass? A 6 pass profile will require the print head to laterally travel 6 times to print 1 linear inch. Lower pass numbers tend to lead to lower resolution and faster printing speed. This means that a higher pass number, like a 12 pass, will provide higher resolution but slower print speed. 4. What pass should I choose when printing? – 4-6 passes are best used when printing a banner. – 8-12 passes can be used when printing for a car wrap and canvas printing. – 12 passes and higher are great for backlit signage as it needs a high ink load. 5. What is the general temperature for vinyl regardless of what printer? In general pre-heat: 96.8°F -104°F (36°C-40°C), Printer: 100.4°F – 104°F (38°C-40°C), Post heat: 122°F- 131°F (50°C-55°C). 6. What happens when the heater setting on a printer is too high? 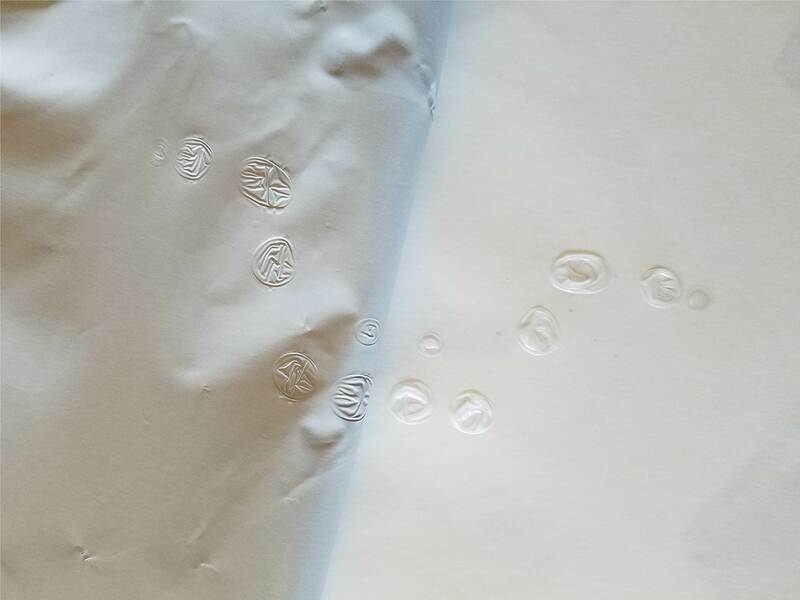 Latex: Blisters can develop on the vinyl surface; print quality can also be reduced. Solvent: Waffling can cause risky print head strikes and damage. Blistering occurs when a heater setting on a printer is too high. 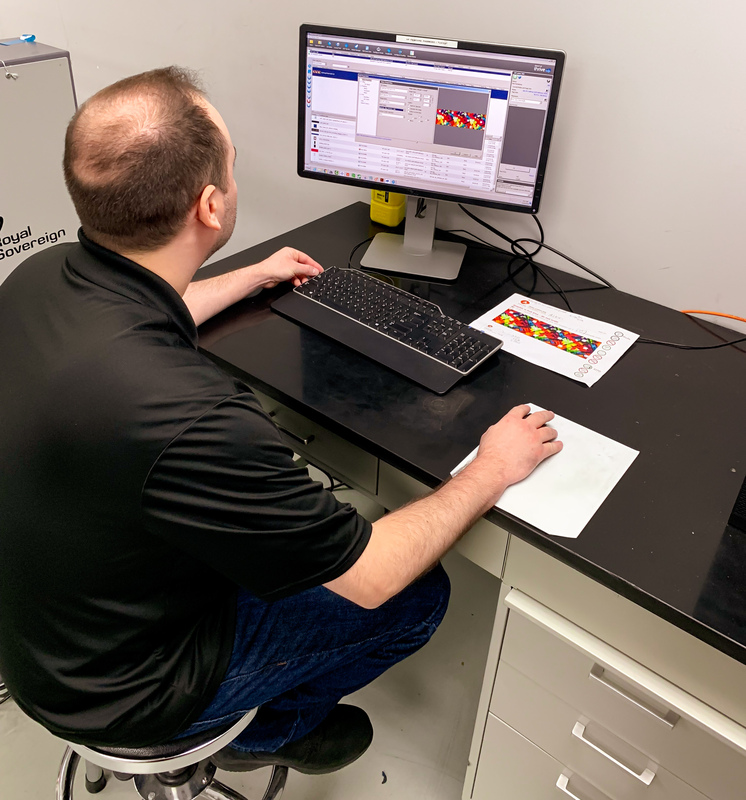 If you’re ever questioning what print profile to use check out Arlon’s ICC Profile Page and if you need help unloading a profile, wrapitright.com has videos for several RIP softwares and printers. A huge thank you to all that visited our booth at SGIA 2018 Las Vegas, NV! This year the show had more than 25,000 registered attendees with a sold-out Expo floor. The aisles were filled continuously with attendees excited to see the latest sign and graphics technology. Arlon had a very successful show, and in case you couldn’t make it here is what you missed. Attendees flocked to the Arlon booth to get hands-on experience with the newest FLITE Technology™ products, SLX™ Cast Wrap and IllumiNITE Wrap™. During the show, the booth was busy with people participating and watching the Wrap Dash. 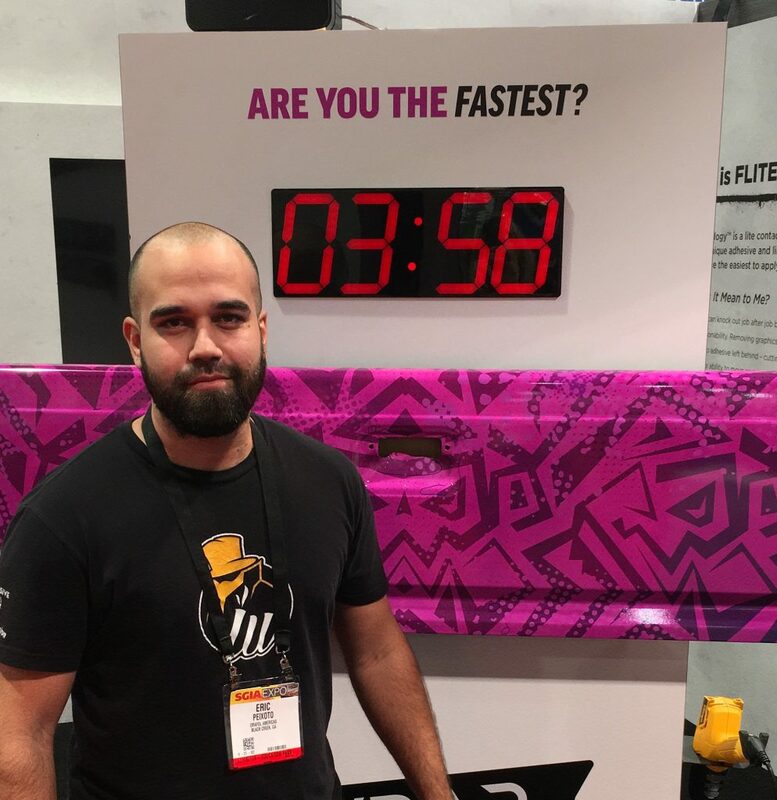 Installers raced against the clock installing SLX Cast Wrap on a truck tailgate and with no surprise the ease of installation that FLITE Technology provides had participants wrapping at an average time of 6:45. In addition to the Wrap Dash, attendees were lined up to get their chance to take a quick tour in the Dark Room Showcase. Visitors were able to experience the vibrant nighttime effects that IllumiNITE Wrap and R108 Conspicuity Tape can have together in adding impressions to corporate branding while keeping safety top of mind. 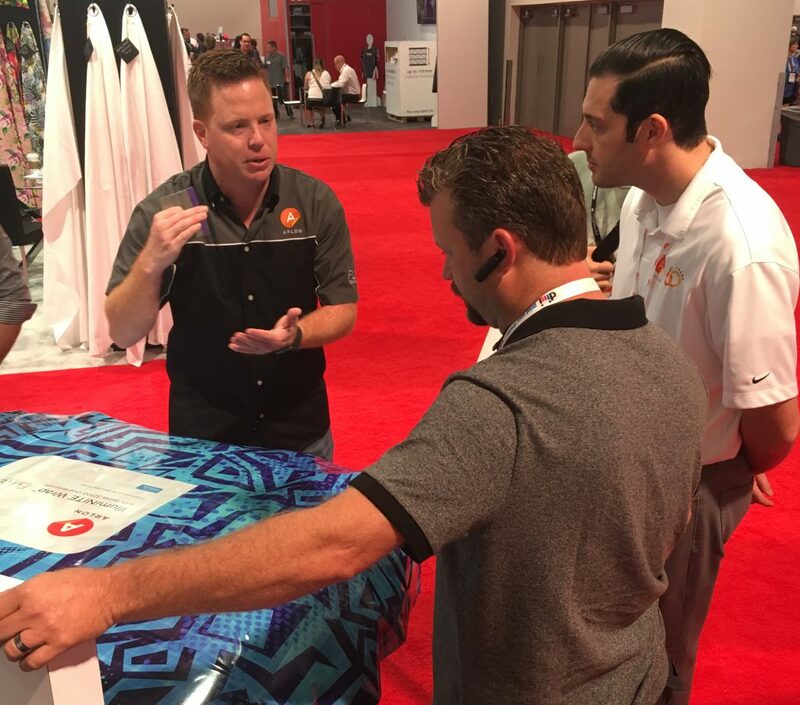 Other highlights included our wrap experts Matt Braswell and Louie Calma holding daily wrap demonstrations showcasing best practices for a successful installation using Arlon products. Arlon Sales Representatives we’re seen throughout the booth providing knowledge and details on all Arlon products. Overall, this show had fantastic energy. Arlon’s booth was a success in providing attendees with an interactive experience. 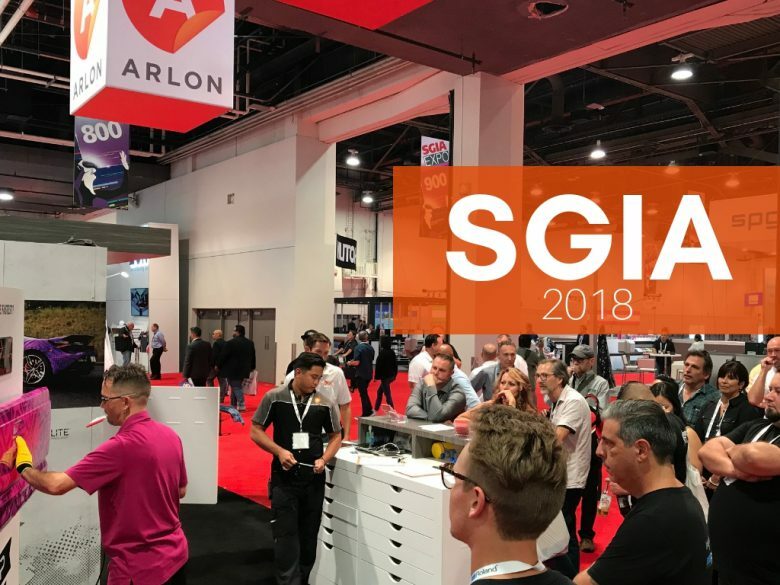 From the Wrap Dash and the Dark Room Showcase to in-booth demonstrations, Arlon brought a fresh feel to the SGIA tradeshow. 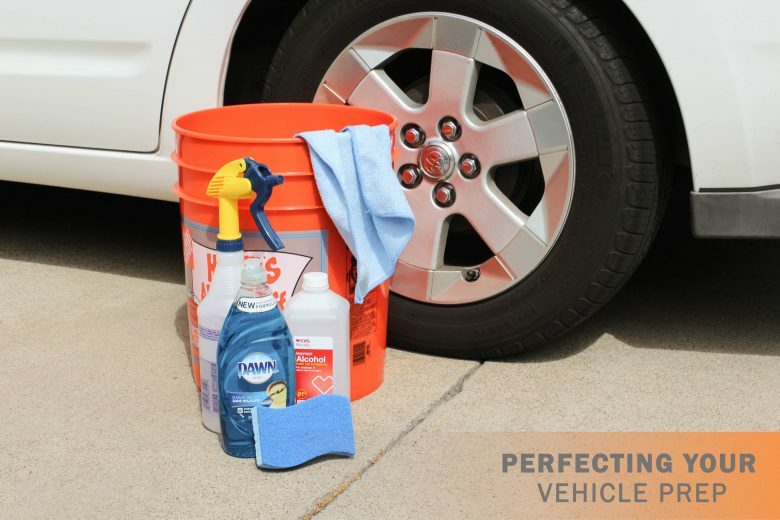 The first step in prepping for the perfect vehicle wrap is washing your vehicle to remove any wax and debris. Wax will affect the adhesive bond on vinyl and not allow the vinyl to properly stay down. 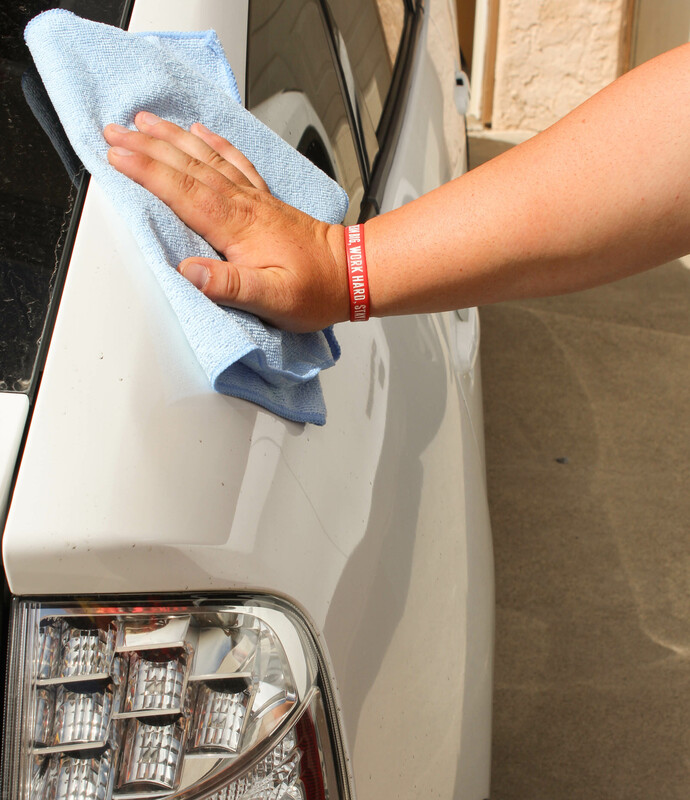 Handwashing is the most thorough way to ensure all areas and surfaces of the vehicle have been properly cleaned. To start the process we recommend using water and a simple degreaser, like dawn dish soap; 1 TBS for every two gallons of water should do the trick. Using a microfiber towel wash the entire vehicle properly. Corners, cracks, and weather trims are all areas that can be tricky to get to and require extra attention. Using the rough side of a sponge on these areas will help remove hidden debris and wax. Even after a hand wash, the surface is not completely cleaned. The last step will be going over the vehicle surfaces with a clean lint-free cloth and isopropyl alcohol (IPA). Using a spray bottle, fill this with equal parts IPA and water. Spray the mixture directly on your substrate and wipe down immediately with your lint-free cloth. 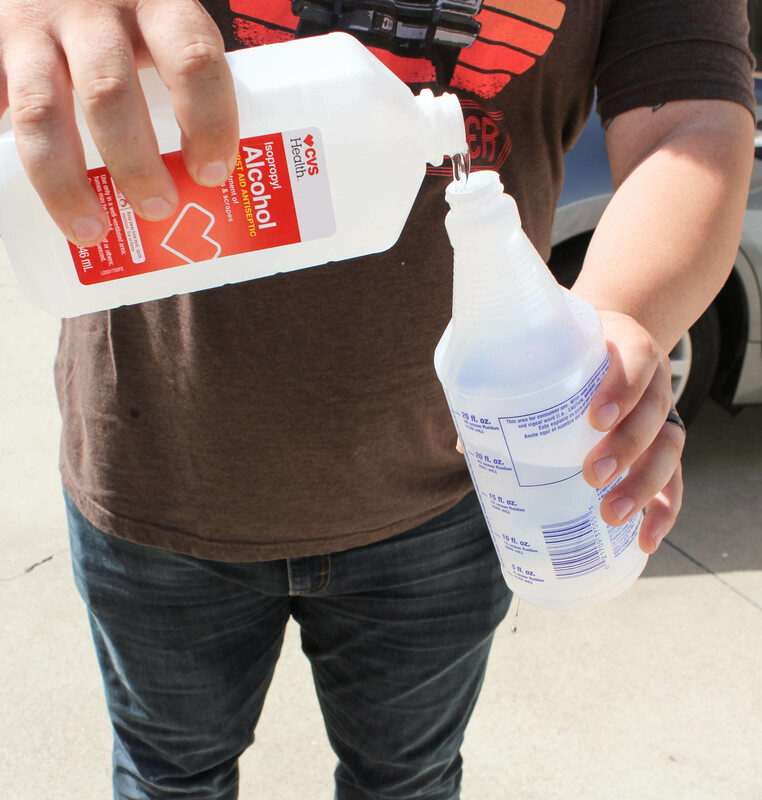 Wiping the vehicle down with this mixture will completely clean the surface of any leftover soap and wax. After the wash, dry every part of the vehicle with a microfiber cloth. Once your vehicle is 100% dry, you can start your install with confidence. Rushing through the vehicle prep can have implications on the success of your wrap so it’s important to never skip through this process! 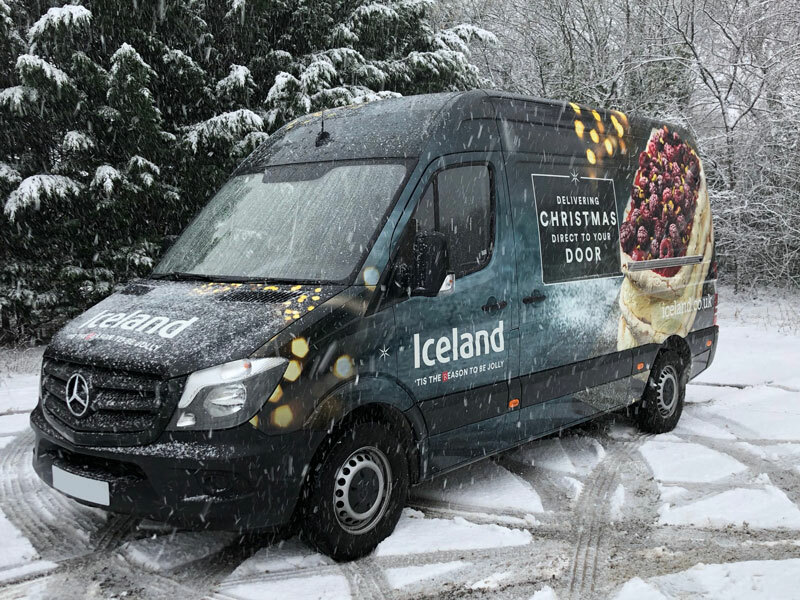 What does Arlon do for Weather Testing? When developing a product, Arlon tests products in extreme climates. We test new products in hot weather climates like Florida, California, and Arizona. During the testing process, we are constantly checking for browning, shrinking, and cracking. This is done to ensure that when you use our film your application will withstand the high temperatures. What can you do to Protect Your Vehicle Wrap? After a period of time, the rays of the sun can take their toll on your vehicle. When you’re not driving your car, it’s best to keep it inside and away from harmful UV Rays. With this in mind, always try to park in a shaded area whenever available. Protective overlaminates are formulated to provide your vehicle wrap with UV protection. Overlaminates act as an additional barrier from the sun. Read more about the importance of overlaminates HERE. In the summer months, dirt and airborne particles can be baked into the film, leaving a stain on the vehicle. This is most common in high volume traffic areas. 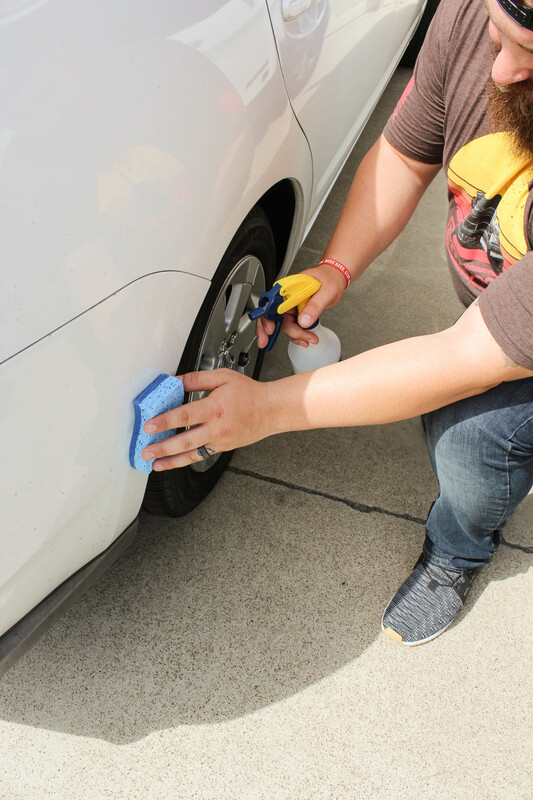 The stain may appear as black dust or overspray but you will not be able to remove it from your vehicle. Always make sure to take a few minutes each day and brush off any particles that may have fallen on to your vehicle. How often you need to wash your vehicle will vary based on your location. You’ll know it’s time to wash your vehicle when you start to see a build up that cannot be wiped off by hand. On hot days, we recommend hand washing with cold-water, preferably in a shaded area. Wash with automotive grade car wash soap and follow the recommended dilution. When temperatures hit triple digits, your wraps need a little extra care. By following the steps listed above, you can keep your vehicle wrap looking brand new. 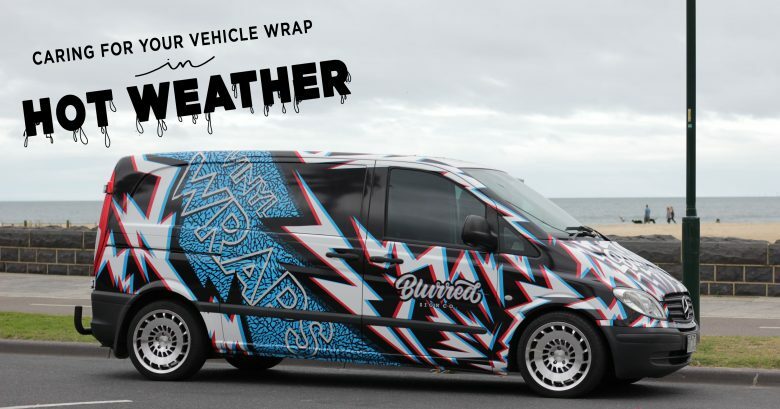 Reflective films are leading the wrap world in an exciting direction, and with no surprise, a product like this can sometimes bring about new challenges. People are considering reflective films not only for additional brand awareness but for cut graphic lettering, decals, fleet markings, and vehicle and fleet wraps. Reflective films have more delicate components in their construction. Keeping this in mind reflective products needs to be handled differently than other cast vinyl film. If a reflective film is mishandled it causes bruising. Bruising occurs when the uniformity of the reflective components is disturbed either by drastically stretching or creasing the film. Once bruising occurs, it can be very difficult to heal the film back to its original state. NOTE: The product on the top is Arlon IllumiNITE Wrap™. The product on the bottom is a leading competitive brand. Both products were subject to the same techniques to amplify bruising. 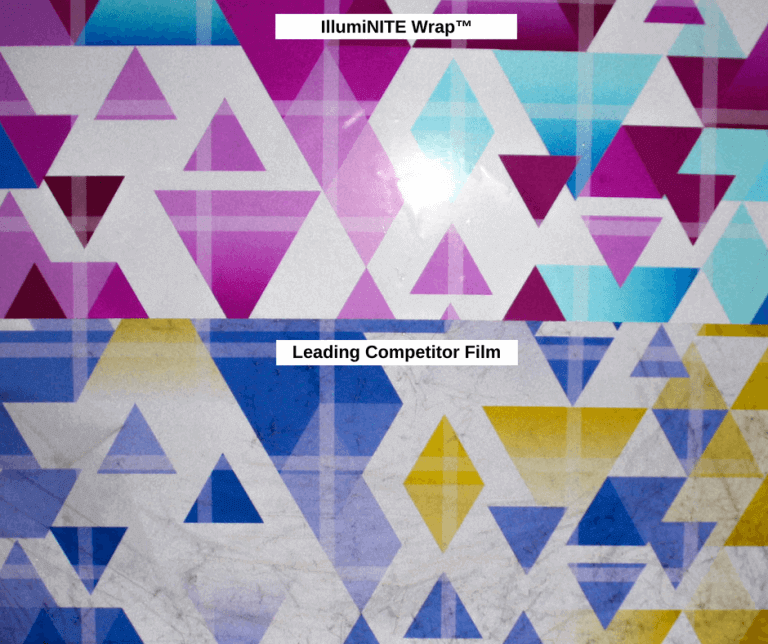 There are ongoing technological innovations that are proprietary to each vinyl manufacturer; Arlon’s latest innovation with FLITE Technology™ gives more power to the installer by providing ease of installation and efficiency. Why does cold weather make cast vinyl difficult to install? The winter months and colder temperatures create a multitude of problems for vinyl installers. Therefore it is important that we explain some of the physical characteristics of both the film and the substrate that are affected by these colder temperatures. So what are the most common obstacles encountered during a cold weather installation? The adhesive can lose a great deal of its tack and won’t bond securely to the substrate’s surface. The ultimate bond level of the adhesive can take longer to be achieved. Condensation can form between the vinyl and the substrate, further impairing the bond level of the adhesive. How can we overcome the effects of cold temperatures? This is the eternal question that faces all manufacturers of vinyl films. 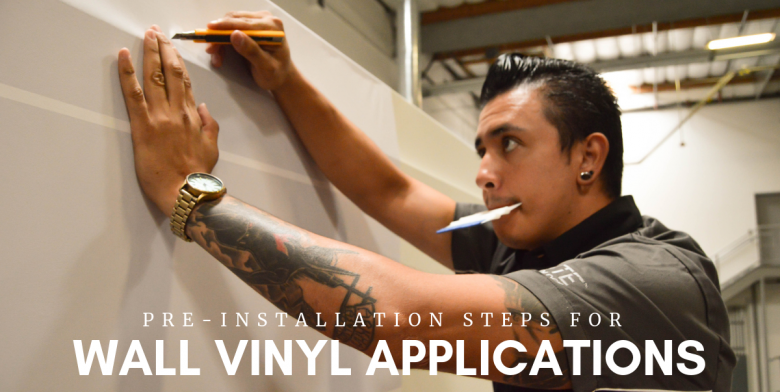 The simple answer is to increase the ambient temperature of the installation environment, substrate, and vinyl. Only then will the film perform as we expect it to. So how is this achieved in cold weather installation? The recommended ambient temperature of the installation area is between 59F – 95F (15C – 36C). Temperatures below this cause the film to become ‘stiff’ or ‘brittle’. Colder temperatures cause the plasticizers in the film to lose their elasticity. It is crucial that the temperature of the environment rises to the recommended levels. The vinyl will then regain its flexible characteristics. These temperature parameters also apply to the substrate. This may mean receiving the vehicle earlier. This will allow the surface temperature to assimilate with the environment. This will help prevent condensation, which will impair the adhesive bond. Placing IR or gas heaters around the vehicle can raise the ambient temperature of the installation area. Increasing the substrate temperature will also improve the bond between vinyl and surface. When the adhesive is cold, it remains hard and loses an amount of its initial tack. Then, the whetting out process is unable to occur. “Whetting out” refers to the effect of squeegee pressure and temperature, relative to the adhesive. Pressure softens the adhesive allowing it to flow and starts the process of bonding to a high level, and cold temperatures have a huge effect on this process. The low temperatures prevent the adhesive from activating effectively. Adding more squeegee pressure can also improve the adhesive bond during colder weather. Increasing the temperature of the substrate, environment, and vinyl lessens the time the film needs to firmly adhere to the vehicle. There is no shortcut to this process. By increasing the temperature as explained above, the vinyl will be soft enough to manipulate around curves and recesses. The adhesive will be able to ‘wet out’ effectively. Post heating the entire vehicle will undoubtedly add time to the installation. But it will also ensure that the vinyl is adhering correctly. Have you tried cold weather installation? You have the power to conquer any installation, especially when you have control over your installation environment. What is your experience with cold weather installation? Tell us about your cold weather installation challenges in the comments! One country, four cities, and over 200 attendees in total. Arlon’s Latin America sales and technical experts hit the road this Spring to co-host an Arlon Training Roadshow with Tubelite De Mexico. Each events objective was to showcase the latest from Arlon’s product portfolio and to offer hands-on training. These roadshows were the talk of the town! Unveiling Arlon’s new game-changing cast wrap product, SLX™ Cast Wrap with FLITE Technology™, was definitely the highlight. Each attendee experienced the benefits of SLX Cast Wrap; seeing how this product could help in reducing labor time with one installer and having superior repositionability. If you’ve ever asked yourself this question, keep reading. By the end of this article you will have a clear understanding of calendered film. Additionally, you will also know when to use each type. We make calendered films through a “melt” process. First, we melt PVC (Poly-Vinyl-Chloride) resin, plasticizer and colorant together. As they cool, we roll the molten PVC through calendering rollers. This creates the final width, thickness, and surface finish of the film. Finally, we wind up the calendered film for further processing. All machines should receive proper care and maintenance to prevent issues or mechanical failures. 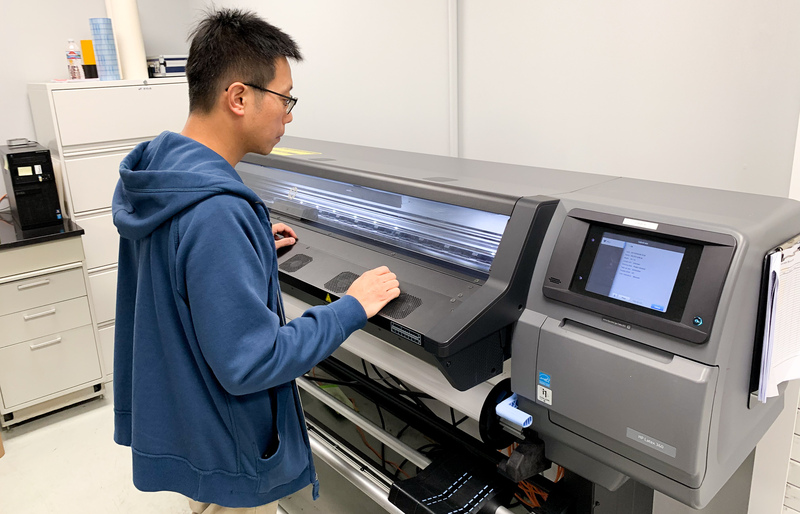 Similar practices apply to large format printers to ensure the longevity of the machine. Regular printer maintenance can also increase productivity and allow for consistent, high-quality prints. Established by its original owners in 1958, Arlon Graphics, LLC is now owned by FLEXcon Company Inc. of Spencer, Massachusetts. Arlon Graphics, LLC has grown to be a worldwide organization with several manufacturing locations and strategically positioned distribution warehouses to best service our various customer bases. Copyright 2019 - Arlon Graphics, LLC. All Rights Reserved.